The closest thing President Trump has to a climate and energy policy is actually a collection of contradictions. He touts natural gas as a carbon-cutting mechanism, but he also promises to bring back the carbon-emitting coal industry. He talks about "clean coal," but his actions will make it harder for "clean coal" technology to make any headway. Why it matters: Misleading statements are nothing new in Washington. But these contradictions are becoming the Trump administration's core policy framework. Top officials, including Secretary of State Rex Tillerson and EPA Administrator Scott Pruitt have over the last couple of weeks repeatedly pushed these contradictory positions, so let's take a closer look at them. Trump and his top advisers credit fracking, the technology that's unlocked vast reserves of cleaner burning natural gas over the past decade, for why U.S. carbon emissions are at levels not seen since before 1994. That's true for the most part, but the rest of the administration's logic on this front is not. Fracking is lowering emissions because natural gas, which burns 50% less carbon emissions than coal, is displacing coal in America's electricity mix. Pruitt and others cite the boom in natural gas to show America is addressing carbon emissions regardless of the Paris climate deal. They also say, though, that withdrawing from the accord and repealing Obama-era environmental regulations will help bring the coal industry back. By Pruitt's own logic, if the Trump administration were to revive the coal industry, it would actually raise U.S. carbon emissions, undermining their only talking point associated with climate change. The EPA didn't respond to multiple requests for comment. 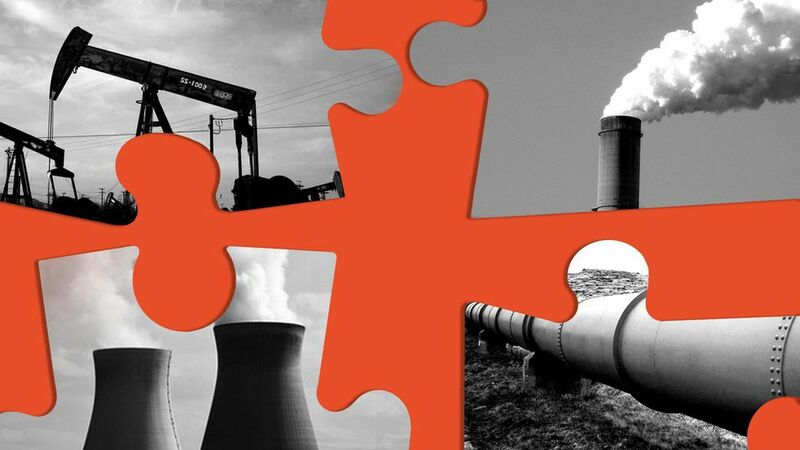 "Ironically, the most successful thing the Trump administration could do to bring back the U.S. coal industry would be to restrict the U.S. natural gas production, but that's not what they're trying to do either," said Trevor Houser, partner at the analysis firm Rhodium Group. "They're unlikely to succeed in bringing coal back, but if they were, U.S. emissions would go back up." Trump talks a lot about "clean coal" and bringing back the coal industry. The term "clean coal" refers to technology that captures carbon from facilities like coal-fired power plants instead of emitting it into the air. Trump doesn't actually talk about the technology when he uses the term. He's wrong on both accounts: He can't revive the coal industry, and his administration's early moves are actually hurting the chances of "clean coal" technology taking off. Market forces outside of the Trump administration's control, like Asian demand for coal and cheap natural-gas prices, are likely to keep the long-term future of the U.S. coal industry somewhere between stagnant and negative. That's the reality no matter what Trump does with the Paris deal or Obama-era regulations. One Obama regulation helped expedite many companies' decision to convert to natural gas: a 2012 rule imposing the first-ever federal limits on power-plant emissions of mercury and other toxic air pollution. The Trump EPA has signaled it may try to reverse at least parts of that rule. But if it succeeds, it wouldn't bring back the coal plants that shut down. Power companies have already made the decades-long investment decisions to shift to natural gas and renewable energy, and market forces will ensure most companies don't revert back to coal. The president's budget proposed to slash the Energy Department's funding for fossil energy by 54%, which among other things provides research and development for "clean coal" technologies. A request for comment to the department wasn't returned. EPA is working to repeal an Obama-era rule cutting carbon emissions from power plants, which could have provided a signal to encourage investment in this type of technology. The administration is undercutting the climate benefits of natural gas in three ways by trying to eliminate voluntary and regulatory actions to cut down on emissions of methane, a potent greenhouse gas that is the primary component of natural gas. Oil and natural-gas companies sometimes inadvertently emit methane while producing and moving the fuel when infrastructure like pipelines aren't available. Last week, the Interior Department delayed a rule requiring new standards for methane emissions from oil and natural gas wells on public lands. Also last week, EPA delayed for two years another rule setting methane standards for new wells. Trump's budget proposed eliminating an EPA voluntary program cutting methane emissions, which has widespread support by industry. Even major oil and gas companies say some type of regulation or voluntary program is important to show the public the industry is responsibly producing a climate-friendly fossil fuel.